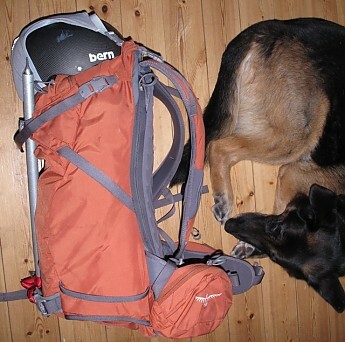 A decent sidecountry pack, but a little too small for full-day backcountry tours. 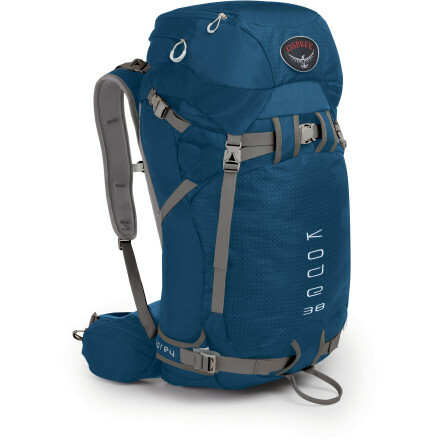 I have used this pack for a couple of seasons, mainly on backcountry ski tours as it is designed for, but also for some day hikes. It's at its best for spring tours when I don't need to carry a lot of extra bulky clothing, but is space-limited for winter tours, especially if I need to carry crampons. 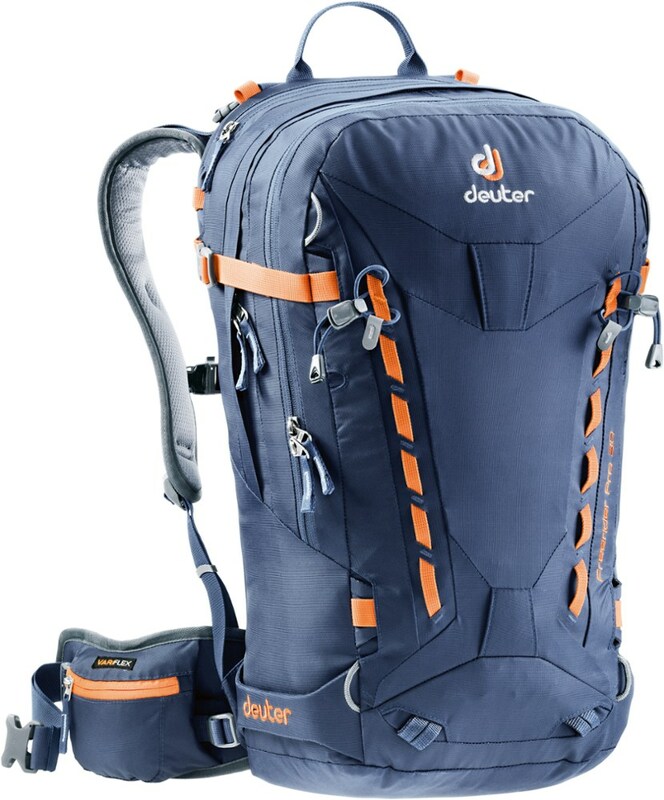 I am tall with a long back, but the pack fits me well, and I like the minimally padded shoulder straps and belt, which are all you need for day trips even i you have to carry skis. The main compartment is accessed by unzipping the back panel, and I assume it's designed this way so that you can lay the back on the snow and get access while carrying skis. That makes sense, but you have to quick-release one or both shoulders straps to open it up, and remember to re-clip them after you close it up, which is a bit fiddly for my taste. The dedicated bladder pocket is great in the springtime, but even with an insulated hose I'm a bit dubious about using a hydration bladder in colder temps, and there are no external water bottle pockets so the only alternative is to use up some of the limited internal space for a water bottle. The main compartment fills up pretty quickly if I am carrying a full down jacket, extra hat and mittens, water bottle, thermos, and lunch, with crampons being the real space-killer. Little or no room left over if I have to take a layer off, so I have to strap anything extra on the outside, which I don't like to do. It is not big enough for hut-to-hut ski trips, where I need to carry at least a sleeping sheet, some extra socks, at least a clean shirt, and maybe some extra snack food even if I am buying all meals along the way. 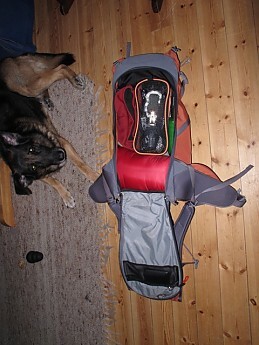 Here it is fully opened up with down jacket, water bottle, hat and mittens, and crampons. There is a zippered top pocket that is supposed to be for goggles, but since there are no other small pockets I tend to use it for small items and stash my goggles in my helmet. 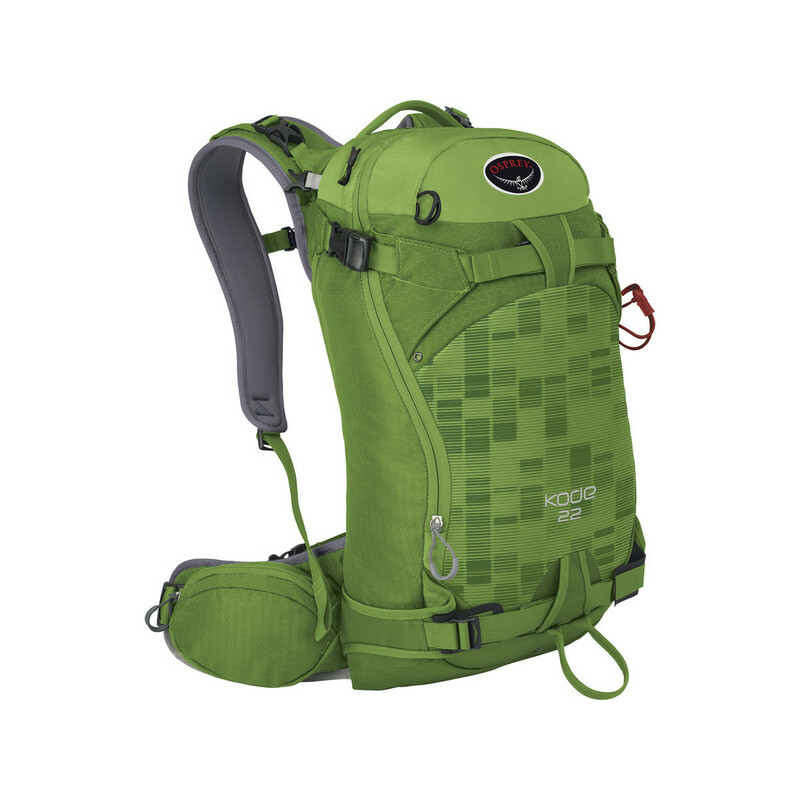 The pocket hangs down into the main compartment and can kind of get in the way when the pack is running really full. The back compartment is designed for a shovel and probe with plenty of room for other gear, with slots for the shovel handle and probe. After trying various arrangements I have found I can fit my compass, emergency bivy, and small first aid kit in there, so it's mainly emergency gear that goes in there, but I will often put my skins in there as well if I'm tight for space in the main compartment. 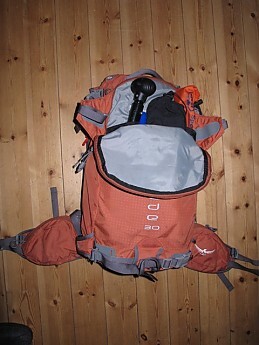 It is not easily accessible when carrying skis and helmet, so it's best not to put lunch, water, etc. in there. To really open it up it is necessary to quick-release the compression straps. Here it open up as far as it will go, with shovel handle, a little bit of the shovel blade, skins, and probe showing. The emergency bivy and first aid kit are in the bottom, an there's a compass in a little pocket hidden by skins. The belt pockets are a nice touch, good for a GPS, sunscreen, and a couple energy bars. My camera will fit in one, but it's not really a pocket camera (Canon G12) so it's too slow and fiddly to unzip and take it out, but a smaller camera would work nicely. The elastic helmet-carry system is quite good, and I haven't any problems with the helmet popping out, which seems like a possibility. Having a separate, zippered compartment just for that seems like overkill -- a little velcro pocket might do just as well. The compression system works fine, but is maybe a little complicated with cam-lock buckles and the central release. 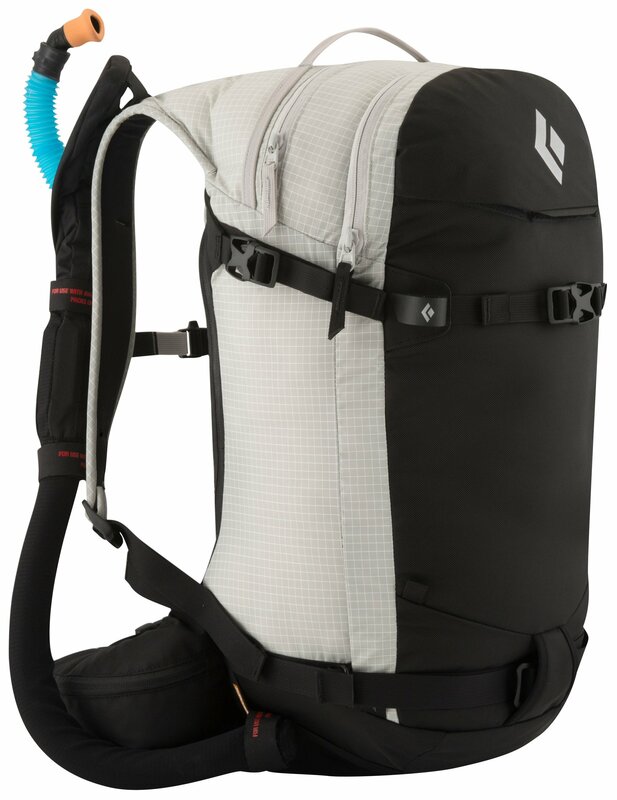 The same straps are part of the ski and snowboard carry system. 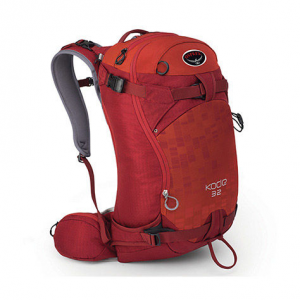 The ski holsters at the bottom accommodate big skis and the whole system gives a good, stable A-frame carry. No comment on other carrying methods or snowboards. The overall construction seems quite tough, so despite the volume and fiddle-factor limitations, I expect to be using this back on backcountry ski trips for many years to come. Nice review, BigRed! Thanks for sharing it. I just received the Kode 30 pack. I have to say the quality is top notch. 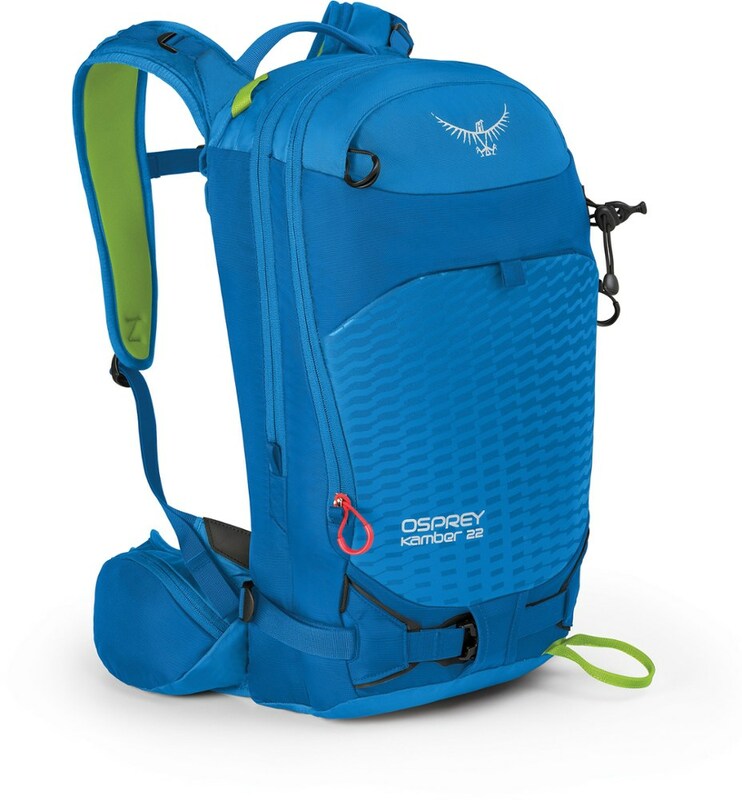 Osprey has thought of everything when designing this. I loaded a whole bunch of gear, MSR stove, pots, pans, goggles, pillows and "stuff" just to see how it handled a load. Perfect. Tried on with a Gore-tex ski jacket and everything is perfect. It's very comfortable. Loaded a pair of Volkls on the back as well and they are tight and supported. I see myself getting a lot of use from this pack. Unless it just self destructs in the near future I can't see anything that I would improve on. I can use this as an all around backpack in the summer as well. 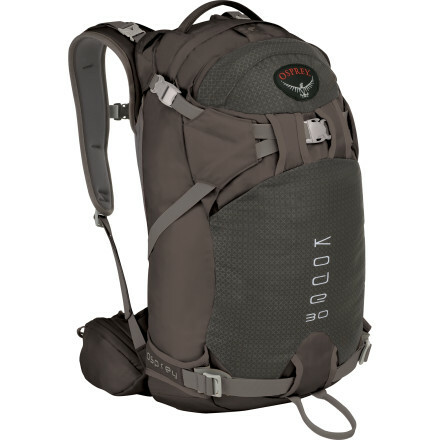 The Osprey Kode 30 is not available from the stores we monitor. It was last seen October 31, 2014	at Moosejaw.